With Expert Insight From: Dr. David Greenfield, Ph.D.; Samuel Hunley, Ph.D.
Our smartphones can cause us to feel isolated and anxious, but only if we let them. Here are some tips for reducing stress related to your phone. The average American spends around five hours on their smartphone every single day. Let’s put this number into perspective. The average American gets roughly six and a half hours of sleep a night on a good day. 40 percent of people actually get less than six hours of sleep. That means we’re spending nearly as much time on our phones as we are sleeping. We’re also raising future generations at risk of technology addiction. 95 percent of U.S. teens have access to a smartphone, while 45 percent of teenagers claim that they’re “online constantly.” More than half of children aged 8 to 12 have a cellphone. The influence of technology on our lives and families is more present than ever before. Not only does our mindless scrolling, Facebook checking, and Instagram photo editing waste precious time, but it can also negatively impact our mental health and daily lives. While smartphones are incredibly useful at times, overuse can become unhealthy. Several studies have found links between excessive smartphone use and mental health disorders, like anxiety and depression. Symptoms like anxiety and withdrawal are becoming a norm when we don’t have access to our phones. We’ve all felt the panic that sets in when our phones hit the dreaded 1% battery. "The last thing they look at at night and the first thing they look at in the morning is their screen." We often feel that we’re missing out on what those in our social circles are doing, which leads to repeatedly checking for new notifications. This fear of missing out, or FOMO, has become a phrase that we hear every day. This need to constantly be in the loop has turned into an addiction for many. The problem is so widespread that there are even smartphone addiction treatment centers throughout the country. Dr. David Greenfield, the founder and medical director of The Center for Internet and Technology Addiction (CITA) and an Assistant Clinical Professor of Psychiatry at the University of Connecticut School of Medicine, has seen the negative impacts of smartphone use first hand. Not only can our excessive cellphone use impact our own lives, but it can also be dangerous to others. “Because smartphones are very compelling and they are addictive, our use of them doesn’t stop when we get in the car. That’s really when smartphones don’t become just a habit, they become a deadly habit … They increase the likelihood of having an accident by 600 or 700 percent,” Dr. Greenfield comments. So what is it about smartphones that keeps us hooked, even though we might end up hurting ourselves or others? We are constantly searching for our next hit of dopamine, which can be so addicting that the smartphone turns into our own personal drug. While cell phones are addictive, there are plenty of methods to break these bad habits and step away from our devices. Looking at a screen too close to your bedtime can interrupt normal sleeping patterns and cause you to get less sleep than you need. In today’s fast-paced environment, you need every minute of sleep that you can get. 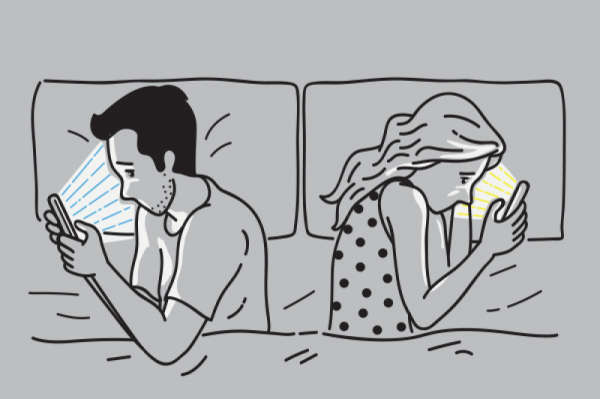 Even if your phone is on silent, the mere presence of it in the bedroom can cause stress and encourage you to check it when you’re trying to sleep. If you use your phone as an alarm, Dr. Greenfield recommends buying a cheap alarm clock to remove the temptation. Dr. Greenfield notes that “notifications urge our nervous system to actually go on the phone and use it.” We’ve all experienced how distracting the ding of a notification can be when we’re trying to focus on something else, so why not just silence it? Instead of pulling your phone out every time you’re in the elevator or waiting in line at the grocery store, learn to be bored for five minutes. Most of the time we only check our phones in these situations to avoid unwanted interactions or to fill idle time. Would it really hurt to just people watch or enjoy some silence for a few minutes? You can also try leaving your phone at home if you don’t need it or leave it in the car when you go out to dinner. You know when your friend tries to talk to you while you’re scrolling through your phone, and you completely blank on what the other person is saying? That happens because our brains aren’t equipped for multitasking. “If you’re on your phone or looking at your phone you are not doing something else,” Dr. Greenfield comments. Using your smartphone doesn’t have to be all bad. Many of us have to be tied to the phone for our jobs, but that doesn’t mean your phone has to cause additional stress or anxiety. Being mindful of how you use your phone will help you identify any unhealthy habits. The easiest way to start being mindful about your phone use is to first understand how often you’re actually on your phone. Dr. Greenfield and Sam Hunley both recommend using a mobile app or the settings on your phone that allow you to monitor your daily screen time. For iPhone users, go to settings and then click on "Screen Time.” This feature gives you different data points about your phone usage including how much time you spend on your phone, how many times you pick your phone up, and how many notifications you receive. You’ll also be able to see a breakdown of how much time is spent on each individual app. Once you’ve decided which apps are problematic for you, you can set daily time limits for those apps. You’ll be reminded to stop using them once you’ve hit a specified length of time. There is also a “Downtime” feature that will disable your apps and text messaging, so you won’t be tempted to use your phone when trying to sleep or focus at work. Google offers a similar feature for Android phones called “Digital Wellbeing,” which is being rolled out for phones on the Android P operating system. This dashboard has similar features to the iPhone Screen Time, including a breakdown of your daily phone use, do not disturb settings, and time limits for apps. One unique feature that the Digital Wellbeing dashboard offers is “Wind Down” mode. When this mode is turned on before bed, the phone’s screen will change to grayscale and the brightness will be lowered over time to make using the phone less appealing. For those who experience stress or anxiety related to their phone use, Hunley recommends mindfulness practices such as grounding exercises or meditation. These practices will help break down habitual or compulsive checking that can cause stress. Get all of your senses involved by describing what you see, smell, hear, and feel. Describe the color of the walls, the smell of the flowers on your nightstand, the texture of your comforter, etc. Make sure to take your time and include as much detail as possible. You’ll slowly begin to feel more calm as you recenter yourself within your surroundings. Create a calming or pleasant mental image in your head. Try to make the image as vivid as possible by including details. Let’s say you’re picturing the beach. What color is your beach towel? How does the ocean smell? How does the sand feel under your feet? What do the waves sound like? Take your time, stretching each muscle with purpose. Reach for your toes, roll your head back and forth, stretch your arms to the ceiling -- really sink into it. Take note of each inhale and exhale, breathing slowly and deeply. This is also a simple way to meditate for those who want to try out meditation but might not know where to start. As weird as it might feel, positive self-talk can have a large impact on your mood. Remind yourself that the anxiety or negative emotions you’re feeling are temporary. Tell yourself that you’re strong enough to get through it. Plan out something nice that you’ll take time to do for yourself. It can be as simple as watching a movie and eating your favorite candy, going out to dinner, or taking a bubble bath. Look at pictures or think of your favorite memories with your friends, family, and anyone else who is important to you. Remind yourself of how thankful you are to have them in your life. Meditation is also very useful for reducing stress and breaking any bad phone habits. For those who have never tried meditation or struggle with it, Hunley suggests trying this beginners guide to meditation. Apps like Headspace, Calm, and The Mindfulness App offer various guided meditations, along with other features like breathing exercises and soothing sounds and stories to help you sleep. If you notice yourself overusing a certain app like YouTube or Facebook, try using a meditation app the next time you unlock your phone to open that app that you overuse. This list of meditation apps includes descriptions and ratings, so you can find the one that’s right for you. If you’re looking for something to replace the hit of dopamine that comes with every notification, Hunley has a few recommendations. The first is to simply exercise. “There’s a lot of brain and neural activity created by [exercise],” Hunley comments. Exercise has countless other health benefits that will contribute to your overall well being. If working out doesn’t sound too appealing to you, start slow. Take a walk around the neighborhood or try climbing the stairs up to your apartment instead of taking the elevator. Fischer, Kristen. “Best Meditation Apps of 2018.” Healthline, 20 Apr. 2018. Greenfield, David. Personal interview. 15 Jan. 2019. Greenfield, David. The Center for Internet and technology Addiction. Dr. David Greenfield, 2018. “Grounding: Create Personal Calm.” Winona State University, 21 Nov. 2016. Hunley, Sam. Personal interview. 10 Jan. 2019. Lynley, Matthew. “Google Rolls out App Time Management Controls.” TechCrunch, 2018. Schlosser, Kurt. “New Research Finds 95% of Teens have Access to a Smartphone; 45% Online ‘Almost Constantly.’” GeekWire, 1 June 2018. Simon, Michael. “iOS SCreen Time vs. Android Digital Wellbeing: Which Phone Addiction Fighter is Better for You?” Macworld, 8 Aug. 2018. Turner, John. The Quiet Kit. John Turner, 2019. Welch, Chris. "How to Test out Google's Digital Wellbeing Features on Android 9 Pie right now." The Verge, 6 Aug. 2018.